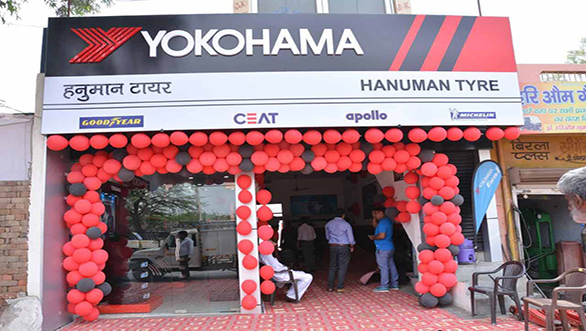 Yokohama India has inaugurated its first outlet in the state of Haryana. Located near Radhaswami Ashram in Bhiwani, this Yokohama Club Network (YCN) outlet is the company's 45th specialised centre in the country. Apart from selling tyres, this new outlet will offer wheel alignment and balancing and nitrogen filling facilities along with selling alloy wheels. In an official release, the company has stated, "The YCN is a specialised network based on the company's global philosophy to create point of sales which will deliver a world-class tyre buying experience." Yokohama India says that currently it has over 825 point of sales, including 44 YCN across the country. Commenting on the launch, Ken Matsukawa, director, Yokohama India, said "Haryana has been always a high-demand state, and the presence of YCNs in its cities will help us augment our growth in India. YCNs have been a main reason that we grew 48.1 per cent in India in 2015, and Yokohama India's future strategy also lies here. This launch will also help bring more options for people driving into Bhiwani." Apart from catering to the demands of the replacement tyre market, Yokohama is also an OEM supplier to leading automobile manufacturers like Audi, Honda, Mercedes-Benz, Porsche and Toyota, to name a few.